Considering that the establishment of Christianity was the most lasting effect of his reign, it is a bit surprising that we don’t know exactly when Constantine became a Christian. It is entirely possible that he was a Christian from birth. His mother Helena seems to have been a Christian and may well have brought her son up that way. This isn’t as much fun as the story I was taught as a child about seeing a cross in the sky on the eve of the battle of the Milvian Bridge – I’ll get to that widely known story a bit later. Another suggestion comes from a contemporary historian who put Constantine’s conversion shortly after his murder of his son and his wife. The priests of the ancient gods wouldn’t forgive this crime so Constantine switched to a religion that would. Being able to select a moral framework to match ones actions does sound convenient, but the timing doesn’t really work. At the same time Constantine was killing his family he was heavily involved in Church politics and any appeal to the pagan heirarchy would not have been remotely credible. In any case, despite his inclinations Constantine held the post of Pontifex Maximus. This put him in charge of the official cult so he wouldn’t have had to seek forgiveness, he could have simply ordered it. If you are a stickler for procedure, the official conversion came very late in life. It wasn’t until he was on his deathbed that he actually got baptised. This seems a bit odd to us, but it wasn’t that unusual at the time. It was normal to at least let children get to the age of understanding what was happening before they were baptised and in a growing religion adult converts were common. I can’t help wondering what is supposed to be achieved by baptising an infant too young to appreciate the significance of the ceremony, but I suppose it helps build social bonds for the other attendees. There has always been a school of thought that has held that in fact Constantine never did become a Christian in the sense of actually believing it. In this view he was simply a cynical politician who swam with a tide for no other reason than it suited his purposes. He certainly did a lot of things that are not congruent with Biblical instructions. The bit about thou shalt not kill springs to mind straight away. The ban on bearing false witness is a tough one to comply with as anyone who has tried putting together a history podcast will tell you, but the extent of Constantine’s propaganda against his enemies went well beyond any interpretation of scripture. In fact modern scholars are very much of the opinion that far from being an anti-Christian tyrant Licinius was at least as indulgent to Christianity as Constantine himself was. He may even have been a believer himself. So it is possible that Constantine was not the first Christian emperor after all. Personally, I don’t think there is much need to select one particular version. If you could go back in time and interview the elderly Constantine it is quite likely that he would not remember when, how or why he adopted Christianity. How many of us really know the reasons why we do anything? And adopting, or indeed abandoning a religion is something that usually takes place imperceptibly over a period of time and takes place way beyond the day to day concerns our prefrontal cortex is preoccupied with. As to the charge of cynicism, most of us can easily cope with holding contradictory opinions and incompatible beliefs simultaneously. Constantine might be the first Christian we know about whose actions bear not the slightest relationship to the precepts of the faith he sincerely held. But he wasn’t going to be the last. And just to make it clear – this is is not by any means a unique feature of Christianity. It is true of other faiths and political ideas as well – let’s face it history would be a dull business if everyone behaved well and you could trust every word that they said. Looking at what Constantine’s career it isn’t hard to imagine him as a man who basically wanted to be a Christian all along, but who was prepared to compromise his behaviour when it suited him. As time goes on his affiliation becomes steadily clearer and in all likelihood his faith grew stronger the more he practised it, and his commitment grew greater the more effort he invested in. The sunk cost fallacy is one of the reasons for the persistence of religious belief in many people and is one of the reasons regular attendance at Church is considered such a high priority for the faithful. But his growing piety did not extend to any particular modification of his policies or behaviour. He continued to centralise power, make the role of the emperor more absolute, torture and kill opponents and tax his subjects to within an inch of their lives throughout his reign. But while he showed sufficient favour and respect to paganism, he helped the Christians far more. The Edict of Milan was one of his earliest actions as sole Augustus in the west. Granting freedom of worship to everyone was actually only an advantage to the Christians. Everyone else had freedom of worship already. He also returned confiscated property to them. This was straight forward enough in the cases where former church lands were still in the hands of the state. Where they had been sold off, the purchasers were compensated. This meant that they got their stuff back without creating bad feeling. He also allowed the Church to run its own court system for keeping its clergy in order – a very significant concession from a controlling personality like Constantine. And finally, he even paid people to convert. He dished out twenty pieces of gold and a white garment per baptism. Given that this was coming on top of forgiveness of your sins and eternal life, it does sound like a good deal. Those who doubt his sincerity don’t have to look far for an ulterior motive. The Church was potentially a very powerful ally. Apart from the army and the emperor’s own administration it was the only empire wide network. In fact its network stretched farther than the empire itself, with congregations in existence in Persia and missionaries already operating as far away as India. And it was a strong and cohesive network with a lot of intercommunication. There were 1800 bishops operating in the empire itself. They were in regular contact with each other and with their supporting priests. Bishops were democratically elected which guaranteed that they must have been reasonably competent. In fact given the steadily decreasing prestige of municipal institutions under Constantine it is quite likely that this was one of the few openings for men of talent. The church provided its followers with a lot more than just spiritual guidance. It was also a social support mechanism in an age when public welfare programmes hadn’t even occurred to anyone as an idea. They also provided a ready made community of people you could trust in a state that liberally employed spies and informers. And in an age when there was no printing press the Church had an unrivaled ability to spread news and information. Although Christians were still a tiny minority of the population, their support was of real value to a busy monarch with a big empire to manage. And there was another opportunity offered by Christianity. Constantine was always interested in securing his position. To a man running a police state the idea of a God who could keep an eye on his subjects even when they were sleeping must have appealed enormously. Christians had a good record for behaving themselves. Spread that around a bit and you have a much more compliant population. Constantine already had the hardware to run a totalitarian state. Christianity provided him with the ideology. Of course it would need a few changes. For example the injunction not to kill was a problem for the army. But the church authorities were happy to iron out these kinds of wrinkles in return for the support of the emperor. It wasn’t long before the rule that had previously prevented Christians serving in the forces was changed to one that made desertion punishable by eteranal damnation. 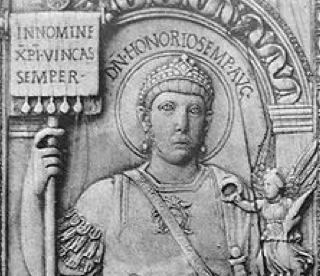 Constantine the pious Christian would have been interested in church doctrine from the point of view of saving his own soul. As a lover of the good news and the community of Christians he would have been keen to see harmony amongst the faithful. There is no reason to doubt his sincerity. But it has to be said to be of any use in holding together a disparate empire the church had to be united and coherent. So it is little wonder to see Constantine intervening to smooth over internal disputes. He did this quite early when he convened a council at Arles in Gaul to sort out the problem of the Donatists in Africa. This was a tricky problem of the purists versus pragmatists variety. A lot of Christians during periods of persecution had chosen to give martyrdom a miss, but now it was back in fashion wanted their old positions back. The ones that had stuck to their guns and risked everything for their faith were reluctant to accept their old brothers back into the fold on equal terms. They appealed directly to Constantine who had got some bishops together to rule on the matter. They ruled in favour of the faint hearts and against the zealots. We’ll be hearing more about the Donatists. While they were at it they also decided that Easter should be celebrated on the same day by everyone, but didn’t come up with a suitable way of identifying Easter. The council of Arles showed Constantine’s willingness to get involved in religious affairs. But he was to get a lot deeper in. In 325 he called the council of Nicea. This really was the big one. It was attended directly by over 300 bishops, with legates sent by most of the others. It involved a lot of talking and covered a lot of ground and went on for two months. Constantine himself participated. But he was very humble about his status as a layman and simply observed what was going on. The immediate cause for the council was a dispute that had broken out in Egypt about the precise nature of the divinity of Christ. A priest called Arius had proposed that as Christ had not always existed he must have been created by God and was therefore to some extent inferior to God. The orthodox line was that Christ was in fact God and the Father and the Son were both equally divine. I have struggled to understand this point. And having understood it, I have struggled to care. I am afraid theological disputes don’t really resonate with atheists. But as I’ve written elsewhere, I never got past the reference to the sky being solid in Genesis Chapter 1 verse 6. The ideas of Arius were opposed, and opposed with great success by Athanasius. Arius ended up getting exiled. But his followers thrived and for a while Arianism was a contender for the standard version of Christianity. It was quite a struggle and next time you hear the Christmas carol Oh Come All Ye Faithful have a listen for the second verse. It goes “Very God, begotten, not created”. This sounds to me like an echo of that third century dispute. Like a lot of arguments, it doesn’t make much sense to people who aren’t actually involved but that doesn’t take the heat out of it. The gathering at Nicea argued about quite a lot of other things. A formal creed that all Christians should accept was drawn up and is still basically in use today. Once there was a generally accepted creed it was possible to deviate from it and officially be a heretic. So Arius and his followers were now heretics, and Athanasius and the people who followed the party line were now the orthodox. Orthodox literally means the ‘correct opinion’. When Gibbon uses this word he is referring to people who accept the rulings of the Council of Nicea. The church was supposed to be all embracing and if you were a Christian you had to join it. It was all embracing, so it was a catholic church. The word catholic in its sense of covering everything was easily confused by a reader of the time to refer to the actual Catholic Church. This was handy for Gibbon’s purpose. He could be critical of the behaviour of the Christians, and quite accurately refer to them as catholics. This made it sound like he was referring to the Catholic Church which at that time would have instinctively been treated as an enemy by any patriotic Briton. This was a neat trick, but it didn’t fool many. But at least the book got published in Britain. In Catholic France it was promptly banned. The subject of Easter was addressed. They argued about that as well, but that at least was resolved. Nowadays the date at which Easter is celebrated is pretty universal though the eastern churches are working on a different calendar. In nearly 2000 years Christians have never managed to reach agreement on key features of their belief or succeeded in coming up with a single organisation suitable for them all to join. But at least they managed to sort out when to celebrate the main event of the faith reasonably early in their history. Quite why the formula for it has to be so complicated I haven’t worked out, but I am not going to complain. I don’t want to set the argument off again. Constantine did not stay for the whole council. He was a busy man. He had an empire to run, a family to murder, that sort of thing. But the Church had a lot to thank him for nonetheless. He had put their finances on a firm footing and secured their property base. They had income from direct contributions from the congregations. They also got grants from Constantine himself for various purposes. They were also now able to receive bequests in the wills of their followers. This had always gone on but there was always the risk of a legal challenge from the family of the deceased. So it is really from this stage that the church starts to acquire considerable quantities of wealth. This has continued to the present day of course and they’ve still got a lot of it. One of the many theories to explain the fall of the empire is that the economy was stifled by the amount of purchasing power continually being withdrawn by donations to the religious sector. Whether or not they had an effect on total spending power empire wide, bishops became the holders of considerable quantities of wealth. Later regulations make it clear that it was felt necessary to monitor their handling of the cash to make sure it was being used for the purposes intended. Bishops became figures of considerable significance and we’ll see them popping up regularly from now on as the history of the empire progresses. They were probably a net benefit to the empire in the early years. Being elected by their peers and speaking on behalf of God, what they said carried a lot of authority. They could oppose bad decisions coming down from the court and organise local responses to particular crises in a way that had become very difficult for the highly centralised and increasingly out of touch imperial apparatus. It was useful to the emperor as well. The Church gave the empire a reason for being, a mission and an ideology. The emperor was styled as God’s vicegerent on Earth and the equal of the Apostles. Given the material help the emperors lavished on their new religion merely being an equal of the Apostles seems like an understatement. And it was a very flexible ideology. It left room for a cult of personality as well. Constantine was the first person to get the treatment. Eusebius, a bishop who worked closely with and must have known Constantine well wrote a hagiographic biography after his death. This seems to be the origin of the Milvian Bridge story. The night before the battle Constantine dreamed that Jesus Christ commanded him to put the Christian emblem on his shields. Then when he was marching along he saw a gold cross in the sky annotated helpfully with the words, ‘by this conquer’. He got the shields marked up and duly won. This divine intervention at the crucial point in his career wasn’t made public until after Constantine was dead, and it was disowned by his family. But with historical records in the hands of the Church it was this version that was, and continues to be, propagated. Another version had ethereal beings dropping from Heaven to actually fight in the battle, but that was too far fetched even for the third century. Constantine did use Christian symbols. The Labarum was a piece of fabric stretched across a pole with the Chi Rho symbol on it. This was supposed to strike fear into the hearts of enemies and to inspire to new heights of efforts the troops following it. No doubt it did. This at least seems to be true. No such thing is known to exist prior to the Milvian Bridge, but there are several images and references to it subsequently including a frieze of one that has the ‘by this conquer’ line graved on it. So although the new religion didn’t actually provide supernatural support it was certainly a very handy thing for Constantine. Communications, propaganda, moral support and an extra source of legitimacy were all benefits well worth having. I have a feeling there was another intangible benefit as well. By being the first Christian emperor Constantine was something new. This break with the past meant he could ditch the problems of the past. Whereas every other dynasty had collapsed into confusion and civil war, with the new dispensation from the one true God everyone could look forward to a new era of peace and prosperity. The concept of Christendom came into being. But none of this came without cost. It is always important to remember that an agrarian economy of a fixed size is a zero sum game. There was a lot of industry and specialisation in the empire, but it only had one energy source. Deploying resources into one area inevitably pulled them away from others. This was true throughout history until coal and oil started to be used, so it was something that Gibbon who still lived in a pre-industrial world would not have given a second thought to. With official approval churches grew and took more and more from the productive. As usual, Gibbon phrases it beautifully. Constantine too easily believed that he should purchase the favor of Heaven, if he maintained the idle at the expense of the industrious; and distributed among the saints the wealth of the republic. No doubt Roman farmers did manage to steadily increase agricultural productivity over time but without extra energy inputs it would have been a slow process. The economy could not grow at anything like the rate we are used to. So a new class of priests with their support staff and infrastructure must have created a new burden for those at the bottom to bear. Someone had to build the new churches. Someone had to feed the new priests. On top of the demands of the army – now bigger than ever – and the court and the administration the empire now had to find the resources to keep thousands engaged in worship full time. This itself would have been hard enough in itself. But despite the mild teachings of its founder, Christianity was not to prove able to bring peace to the empire. In fact it did the exact opposite, as we’ll hear in the next episode.